Benji loves kites, he loves watching them fly high in the sky, but he keeps losing kites to the wind! One day he sees a huge, beautiful kite in the kite shop that he just must have. His mom lets him have the kite, IF he earns the money himself by weeding. After several days of weeding the garden, he finally gets to fly his new big orange kite! 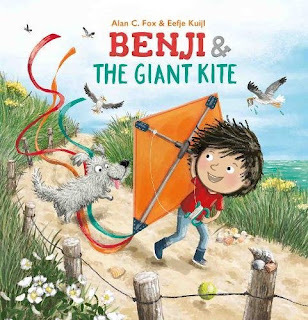 Benji and the Giant Kite is such a sweet little story. It teaches the importance of earning money for what you want and the importance of being able to wait if you really want something. It has nice large, artistic illustrations on each page and the reading level is appropriate for kids who have made it to picture books with several lines on each page. This is a fun little book for summer that will inspire kids to get out and have a little fun and earn what they want with their own two hands. Disclaimer: A free review copy of this book was provided for review purposes only. All opinions are 100% my own as usual.